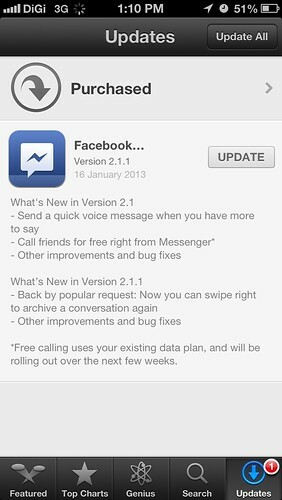 Facebook has rolled out the new updates for its Facebook Messeger for iOS platform. You can now call your friend in Facebook for free. But this feature is only limited to United State Users only. This is pretty handy for people who like to talk instead of typing especially most of your friend are on the same social networking system, Facebook. Remeber, the VoIP in Facebook Messenger uses data connection. Thus it may cause you extra charge if you don’t have “unlimited” data package from your telco.